As public awareness grows that human-caused warming is false, the extent and degree of attempts to scare the public increases. The scare preference is for remote geographic areas such as the Arctic or Antarctic or complex obscure topics ideally with global implications, which the public knows little about. The latest scare story is ocean acidification, which combines these traits with the advantage of a word with negative connotations and used before in acid rain. Like all scares, it is based on total acceptance that an increase in atmospheric CO2 is a problem. The claim in this case is it is causing temperature increase, but also changing the chemistry of the oceans. Like all the scares, it is pure speculation after you accept the false claim CO2 is causing temperature increase. To counteract suggestions that they are overstating the threat, they use a form of the precautionary principle which holds we must act anyway. We don’t even know if a problem exists – or, if it did, what impact it would have. Yet the full impact of ocean acidification and how these impacts may propagate through marine ecosystems and affect fisheries remains largely unknown. Oceans absorb or release CO2 primarily determined by the amount in the atmosphere and the water temperature. The argument is that regardless of what the air temperature does increased CO2 amount in the atmosphere due to human activity guarantees more going into the oceans. This change results in a change in water chemistry reflected in one measure, the pH. A solution has a pH level that is a measure of the acidity or alkalinity. The pH scale is from 0 to 14 and a measure of 7 is neutral. The scale is created relative to standard solutions and agreed on internationally. Above 7 the solution is more alkaline and below 7 it is more acid. The oceans are considered to have a pH of 8.2 with a variance of 0.3, so it is an alkaline solution. The claim of ocean acidification is based on estimates and computer models; these use the very questionable pre-industrial atmospheric level of CO2 to calculate an increase of about 0.1 pH units. Of course, the Intergovernmental Panel on Climate Change (IPCC) attributes the CO2 increase to human production, which is wrong because the global carbon cycle is very vague about sources, storage and length of time in each condition. For example, the error in the estimate of CO2 from the oceans each year is greater than the total human contribution. Even if CO2 increases to 560 ppm by 2050 as the IPCC predict, it would only result in a 0.2 unit reduction of pH. This is still within the error of the estimate of global average. Ocean acidification is more rapid than ever in the history of the earth and if you look at the pCO2 (partial pressure of carbon dioxide) levels we have reached now, you have to go back 35 million years in time to find the equivalents. Scares also require an impending critical point beyond which remedial action is useless. This so-called “tipping point” is currently estimated to allow a drop of about 0.2 pH units, a value that could be reached in as near as 30 years. It is no surprise the author of these outrageous and incorrect remarks is chair of the EuroCLIMATE program Scientific Committee. 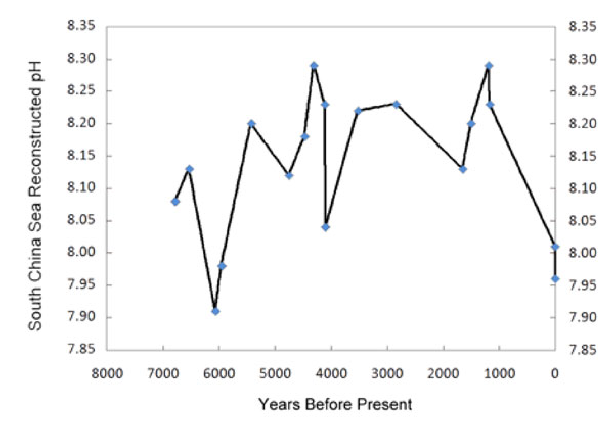 A plot of CO2 levels over the last 600 million years shows current levels are very low at 385 ppm. 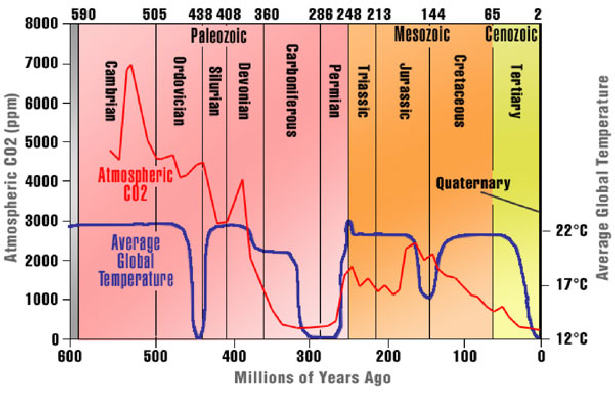 The only period in 600 million years when CO2 levels were equal to the present was over 300 million years ago. Since that time CO2 levels averaged 1000 to 1200 ppm or 3 to 4 times current levels. How did the plant and animal life survive those levels? It makes a mockery of the claim that even a doubling of atmospheric CO2 is a problem. More recent measures of pH levels show how current levels and claimed changes are well within natural variability. Here is a reconstruction of pH levels for the South China Seas by Liu et al (2009) that illustrates the point. It may well be, but we’re not scientifically there yet. That contradicts the message from the reports he helped author. It also disavows the claim the science is settled. The outrage is alarmists continue to present a message of certainty. However, just in case you are wavering, the sky is definitely falling and they will continue to produce outrageous unsubstantiated scares to prove it. 4. What is the US President Talking About?